Providing you the highest quality of signage is what we do. 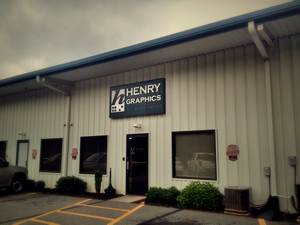 Henry Graphics, Inc. is a Georgia-based manufacturer and designer of architectural signage programs. Our work ranges from ADA-compliant interior wayfinding signs, to illuminated monuments and building signage. HGI has performed work all across the United States of America and has become one of the premier signage firms in the Southeast. The company was founded in 1994 by Shannon Henry who has spent his life in the sign industry. His goal was to build better architectural signs than anyone else and to deliver the best customer service possible. HGI's areas of expertise are wide ranging, including: medical facilities, municipal wayfinding and branding, retail and corporate identification, sports stadiums, multi-family housing, hotels, educational facilities, parking decks, airports, digital printing, and electronic message centers. Our team is one of the most experienced and knowledgeable in the sign industry. We have in-house graphic designers, fabricators, painters, installers, permit expediters, and project managers to handle all of our clients' needs. We strive to achieve the highest level of designs possible, and bringing that to you. When you work with us, you will be making an important step forward in the success of your business by bringing in a higher level of professionalism with our signage. We know what it takes to make a business successful with excellent signs and graphics, and we want to bring that knowledge and success to you. At Henry Graphics, we work on a wide array of projects of many different styles and sizes. We have been doing this for many years and as such, we have developed quite a large portfolio of completed projects. We hope you will take the time to check our portfolio out, so you can see for yourself what we might be able to do for you.